The R-PLEX Mouse Leptin Antibody Set includes a matched capture and detection antibody pair and calibrator for the quick and easy measurement of Leptin in biological samples. R-PLEX products leverage MSD’s electrochemiluminescence technology for better sensitivity and a larger dynamic range than traditional ELISAs. R-PLEX matched antibody sets enable the development of singleplex and multiplex immunoassays. Individual assays may be developed using MSD avidin- or streptavidin-coated plates. Custom multiplex assays with any combination of R-PLEX analytes, as well as R-PLEX plus U-PLEX analytes, can be developed on U-PLEX MULTI-SPOT plates. To learn more about the advantages of R-PLEX products click here. 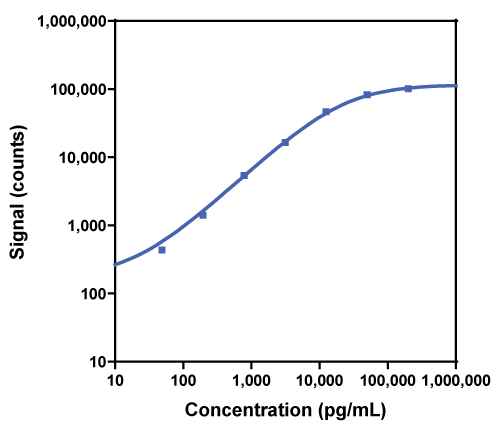 Calibration curve for the R-PLEX Mouse Leptin Antibody Set was assessed and representative data are presented below. Description - Leptin (OB, OBS, LEP, LEPD) is released by adipocytes. Leptin plays a key role in metabolism and regulation of adipose tissue. It is released in amounts mirroring overall body fat stores and acts on neurons and hypothalamic receptors, thereby influencing the brain’s perception of appetite. The absence of leptin leads to uncontrolled food intake and resulting obesity. Leptin may be a critical regulator of obesity that is often accompanied by insulin resistance and hyperinsulinemia. Genetic Deletion and Pharmacological Inhibition of Phosphodiesterase 10A Protects Mice From Diet-Induced Obesity and Insulin Resistance. A multi-biomarker score measures rheumatoid arthritis disease activity in the BeSt study. Efficacy and safety of mavrilimumab in subjects with rheumatoid arthritis. Elevated insulin-like growth factor binding protein-1 (IGFBP-1) in men with metastatic prostate cancer starting androgen deprivation therapy (ADT) is associated with shorter time to castration resistance and overall survival. Endurance training in prostate cancer patients treated with androgen deprivation therapy.